Will bezel-less phones be the next big thing? China's ZTE certainly thinks so. On Wednesday, the company's Nubia brand unveiled the Z9, a product that comes without the black border found on so many smartphone screens. I had a chance to try out the device, and found both pros and cons with the product. On the plus side, the Z9 truly is a bezel-free device. The 5.2-inch screen extends across the glass surface from edge to edge, where it curves down to meet the phone's protective metal frame. As a result, the phone does feel a bit more compact in terms of its width, which measures 68.3mm (2.7 inches). Some might be concerned that the lack of bezels will make the phone hard to use. Touchscreens, after all, tend to be sensitive, and any over-gripping could be misread as actual inputs. However, in the short time I tried the Z9, I didn't have any problems with the touchscreen. The Nubia team said during the product unveiling it anticipated challenges, and instead has tried to turn them into an advantage. It's done this by incorporating certain touch controls that work by placing fingers along the curved edge of the screen. For example, a user can alter the phone's brightness, by simultaneously sliding two fingers down on the opposite sides of the display. Users can even automatically switch to camera mode, by flipping the phone horizontally, like they're ready to take a picture. The phone's software will activate and move into photo-snapping mode, when it reads that four fingers are holding the screen at its edges. The Nubia team said these features are part of its "Frame Interactive Technology," which will be expanded to include an array of other gesture controls. When I tried these features, I found that they worked most of the time, but not always. It's still simply faster to do these functions manually, rather than rely on the software to wait and hopefully read your fingers. Overall, the phone looks very polished, with its 1080p screen and premium build. But on the negative side, ZTE's bezel-less phone feels a little heavy. The Nubia team covered both the front and back in glass, and it weighs in at 192 grams (6.7 ounces). The iPhone 6 Plus, in contrast, comes in at 172 grams. The back side of the Z9 also felt warm after using it for while. This might have something to do with its Qualcomm Snapdragon 810 processor, which has spurred concerns about overheating. In terms of specs, the Z9 is a high-end 4G handset loaded with cutting-edge phone technologies. The "classic" version of the phone, which is priced at 3499 yuan (US$574), comes with 3GB of RAM, 32GB of storage, and a 2900 mAh battery. In the back is an 16-megapixel camera, and in the front is an 8-megapixel camera. On the right side of the phone there's an additional physical button dedicated to snapping pictures. During my time with the phone, the software ran smoothly, and the camera generally produced clear and sharp photos. 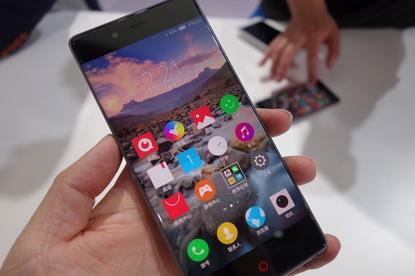 As for the bezel-less screen, the Z9 could be a preview of the future, but the phone isn't any kind of game-changer. Although it looks nice, the lack of bezels doesn't really add anything, and can easily be forgotten. However, in a market already crowded with competition, it might just be a way for ZTE's Nubia brand to gain some more visibility. The Z9 will go on sale in China on May 21. This year, the Nubia brand also plans to expand more international markets such as the U.S., but its unclear when the Z9 will be shipped outside of China.